Radio frequency (RF) technology can be found in a growing number of today's automotive and consumer electronics applications, including keyless entry modules, tire pressure monitoring systems and remote control modules. The use of RF transmitters and receivers in these products means that an integrated testing solution is required to ensure full functionality and quality. Sterner Automation provides systems to meet these specialized requirements including our RF integrated test station (ITS). This all-in-one solution streamlines operator interaction and allows manufacturers to not only fully test RF functionality, but also to scan barcodes, program and configure individual modules, test all I/O and modes of operation, as well as accurately label products and transmit test results. 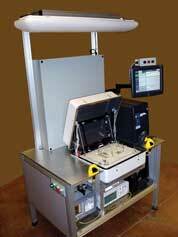 This integrated RF station can meet your current and future testing requirements. Sharpen your competitive edge by integrating Sterner Automation RF solutions into your production process today!